Wholesale Bath Towels 24x50(10Lb)in premium grade optical white can easily be used where there is need of soft towels like premium bath towels. It’s important for you to make your clients feel pampered from the moment they step foot into your facility to the instant they leave. Be sure nothing is left to chance, including the types of spa bath towels you have at their disposal. These 100 percent cotton bath towels are a generous 24 inches by 50 inches, and give your spa the professional look you need. Every customer who wraps up in these spa bath towels will have a sense of being comforted and soothed. Order the right amount of bath towels for your business today, and we’ll ship them to you promptly. Cotton is a luxurious fabric for many reasons. From an appearance standpoint, it simply looks lush. Cotton fibers fluff up nicely, whether or not you add fabric softener to your washing machine. Plus, because these bath towels come in pristine white, they showcase your facility as a clean, fresh location to enjoy spa treatments. From a practical point of view, cotton is extremely thirsty. This means your spa guests only need one cotton bath towel, rather than several, to get completely dry. Not only does that save them time and effort, but it also saves you from requiring more freshly laundered bath towels day after day. 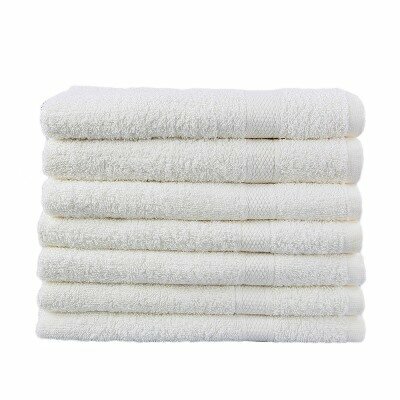 Another functional aspect to cotton spa bath towels is that they’re built to be strong. You can trust they won’t fall apart like other types of bath towels. Show your clients you’re serious about making them feel like royalty at your spa. Order premium cotton spa bath towels by the dozen today.